Apart from pad Thai, smoothies and kebabs on Khao San Road, ordering street food in Bangkok can be frustrating if you don’t know the lingo. Menus are often posted only in Thai and many basic dishes — like som tam and noodle soup — come with a range of options that can leave travellers dumbfounded. 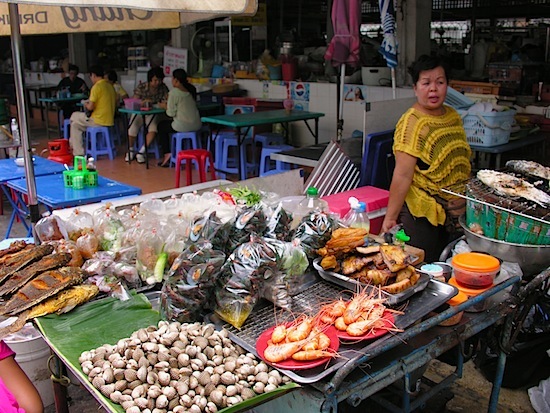 For good and authentic street food in an accessible package, head to Silom Soi 20. Typical scene on Silom Soi 20. This tightly packed side street off Silom Road in Bangrak is an exceptional example of Bangkok’s multiculturalism. A very active mosque sits at the centre of the soi and the city’s largest Hindu temple is just across the street. Expect to see grilled pork being sold at one stand and Muslim curries at the next. Owing to the area’s Southern Indian influence, the soi ebbs and flows to a soundtrack of Indian hits that pulse from a music vendors’ soundsystem day and night. Soi 20 hosts dozens of vendors selling typical and cheap Thai-Chinese street food, and foreigners are not only welcomed here — they’re expected. We’d guess that about half of the Silom 20 street food business comes from foreign travellers; it almost feels like the strip was created specifically as a place for non-Thai speakers to sample real Thai street food. The vendors probably never went looking for business from tourists, but it came naturally when countless hotels opened nearby in the 1980s and ’90s. Vendors apparently noticed that many foreigners actually like the street eating (and drinking) experience, so as the old adage goes: if it ain’t broke, don’t fix it. Iced Changs at noon are perfectly acceptable on Soi 20. As for ambience, well, it’s a Bangkok side street. Expect flimsy steel tables and plastic chairs on pavement, and watch out for motorbikes and tuk tuks. On our most recent visit, we had to drag our table out of the path of a few guys who were moving an old fridge. Eating in a setting like this isn’t for everyone, but we’ll take it over a sterile hotel restaurant any day. That would be the boss/mom. 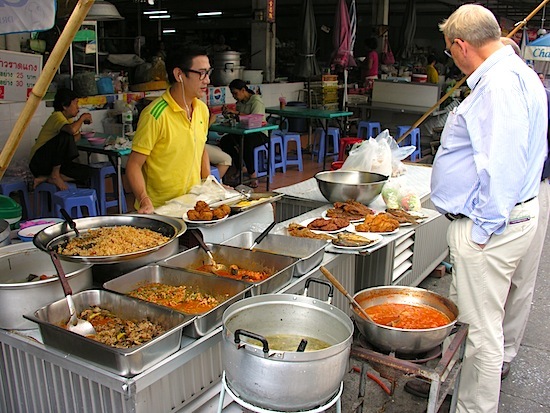 Prices aren’t quite as low as you’ll find on the streets of less touristy areas, but dishes are still very cheap. 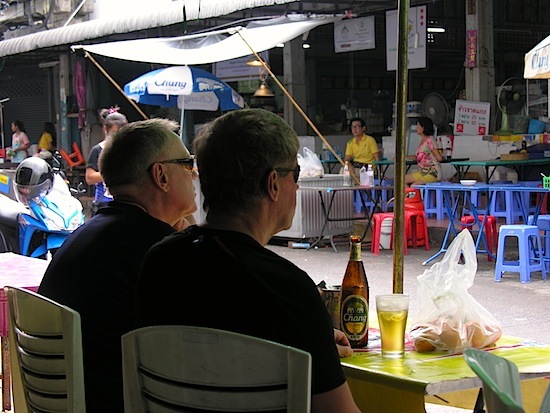 We recommend heading straight back towards the wet market and grabbing a seat at any random outside table. Service is a little confusing as there’s no way to tell which tables belong to which food stalls, but actually, most tables are shared by all food stalls. A som tam lady, grilled seafood guru and mango-with-sticky-rice dude — plus many more — have all collaborated on a single menu. Not a professional translation, perhaps, but it gets the job done. We love the thoughtful thanks at the bottom. One or two basic English-speakers appear to be on ‘server’ duty at any given time, but they collect orders from several different stalls. If you see something that’s not on the menu — from a neighbouring noodle soup or khao kha muu (stewed pork shoulder with rice) joint for example — those vendors will be happy to bring whatever you want to wherever you’re sitting. It’s one big loosely aligned team, and it’s fine to order directly from vendors or from the menu while seated. You can sample several different foods from several different vendors without ever getting up. Although a decent range of food is available, barbecued chicken, pork, prawns, several types of whole fishes and a few selections of shellfish are always popular. 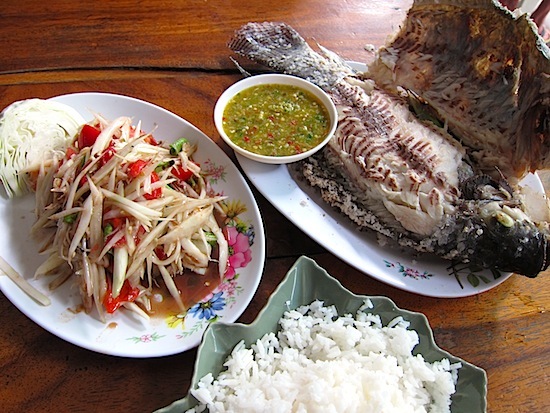 For lunch, we often go with the classic pla plao (salted and grilled whole river fish) with lime-chilli sauce and spicy som tam puu pla raa (northeastern Thai style som tam with pickled crab and fermented fish sauce). Lunch of champions; note the Christmas tree platter used as a rice dish. A great som tam isn’t easy to achieve, but this one hit just the right balance of salty, sour and spicy, and the fish was tender without being undercooked in the middle. Although we ordered two, one plate of white rice is large enough for all but the hungriest two diners to share. 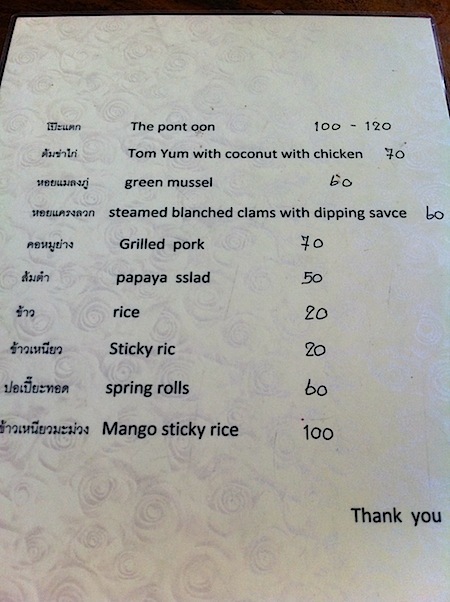 Along with a Coke and bottled water, we left sufficiently stuffed for 195 baht. Silom Soi 20 is easy to find. From Chong Nonsi BTS station, take exit 3 and walk straight at the end of the stairs, then hang a left onto Silom Road, cross the street when you can, and Soi 20 (aka Soi Pandit) will be on the right after a half kilometre. Noodle and kap khao vendors get rolling in the morning while seafood grills open at midday and keep those irresistible aromas wafting well into the night, when Soi 20 is especially hopping. Last updated on 28th March, 2017. Daily, all day and until late.